On 25 April, Belarus ' State Military Industrial Committee announced that in the first quarter of 2016 its defence industrial enterprises had increased exports by 31 per cent compared to the previous year. Their net profit grew even more, by 1.6 times. Remarkably, the Belarusian defence industry has succeeded even while Moscow continues its policy of restricting access to Russian markets for Belarusian defence firms. The Kremlin continues to design substitutes for Belarusian products. Minsk is responding by cooperating with Ukraine, China and numerous developing countries. The Kremlin is effectively forcing Belarusians to distance themselves from Moscow and build the economic foundations for an independent state. On 20 April, President Alexander Lukashenka announced that Minsk would sell Russia the Minsk Wheeled Tractors Factory (MZKT) only if Moscow gave Belarus some oil deposits in Siberia. 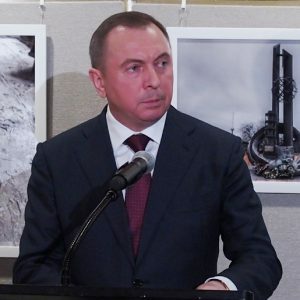 The Moscow-based Vzglyad daily commented that Lukashenka himself realised that the Kremlin will neither pay the price he demanded nor give him an oil deposit. MZKT for many years has provided Soviet and later Russian missile and rocket systems with chassis. 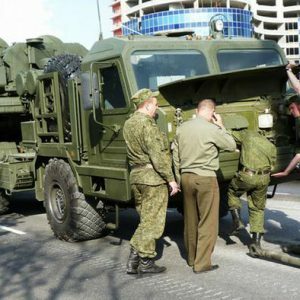 Among them are the famous missile system Iskander, multiple rocket launcher systems Uragan and Grad, surface-to-air missile systems Tor, Buk, S-300 and S-400, ballistic missile systems Topol and Yars, and others. According to Russian experts, Russia buys between 60 per cent and 90 per cent of MZKT's production. Throughout the 2010s, Russian firms repeatedly claimed to have designed replacements for the Belarusian MZKT chassis. This happened most recently in March when Almaz-Antei said it was ready to cease using Belarusian products. Yet Moscow still wants to acquire MZKT products and Russian firms continue to install their weapons on Belarusian chassis. This raises questions about the veracity of Russia's claims and threats. The Kremlin's official policies reflect that. Recently, Minsk even complained to the Eurasian Economic Commission (EEC), a body established in the course of Eurasian integration, about Russian regulations on defence orders. Specifically, it challenged the decision of Russia's cabinet of ministers of 29 December 2015 that restricted acquisition of foreign goods and services for Russia's defence needs. On 12 April, the EEC recognised that the Russian government had violated the principle of equal access to the government's orders for participants in the Eurasian integration process. But Minsk has nothing to celebrate: Moscow is known to have simply ignored earlier such verdicts of the EEC. It is partly true. Belarusian industry is hardly currently in a position to find a good replacement for Russian markets and partners. But if Putin attempts to squeeze Belarusians out of Russia, they are not going to surrender and are already working on alternatives. Belarus' continuing large-scale cooperation with Ukraine fits this pattern. The most well known illustration of this concerns MAZ activities in Ukraine. In March Belarusian truck manufacturer MAZ signed an agreement on establishing a production line of trucks in Ukraine's Cherkasy with the Ukrainian corporation Bohdan. It will manufacture trucks according to both civilian and military modifications using Belarusian and Ukrainian components. That creates an alternative to the established Ukrainian KrAZ truck production works. Ukrainian president Petro Poroshenko allegedly responded to criticism about neglecting the existing KrAZ production by explaining that Belarusian trucks successfully passed the necessary tests and are more resilient in combat conditions. On the basis of MAZ-6317 the Ukrainians have also designed an armoured vehicle for their police and National Guard. According to MAZ's own information, the company has become a leader in sales of trucks of a corresponding type in Ukraine after providing Kyiv with 294 trucks in 2015. According to Lyashko, in February Kyiv may have bought another 120 MAZ trucks. Belarus continues to do numerous defence industrial projects with China or other, more distant countries. In March a military parade in Myanmar featured surface-to-air missile system Kvadrat-M modernised by the Belarusian firm Alevkurp. Incidentally, its launchers also operate on the MZKT chassis. Another Belarusian firm, Minotor-Service, last year modernised almost 500 BTR-50s for Egypt. Circumstantial evidence points to some unpublicised major deals on military equipment being underway with Pakistan. Recent months have seen other significant breakthroughs. On 26-27 February Defense Minister of Thailand Prawit Wongsuwan came to Minsk. On 28-30 April he was followed by Defence Minister of Indonesia Ryamizard Ryacudu who was also received at the highest level, by Lukashenka. These efforts to diversify the markets and partners of the Belarusian defence industry have already brought some results. The National defence industry achieved good results not only in the first months of this year but also in 2015. Based on the results of the economic activity of Belarusian firms in 2015, the government has included on its list of the 29 most profitable national enterprises three major defence firms. That represents not only an honour but also a commitment to make a contribution to the state budget fund of national development. Russian politicians and experts are quick to dismiss their official Belarusian allies. The Kremlin apparently believes that Minsk has no choice but to gradually surrender Russians national economic assets or even statehood. That is the mindset that Russian leaders have displayed with regard to former Soviet nations since 1991. History proved them wrong many times as the former Soviet countries distanced themselves from Russia after experiencing such attitudes. Belarus could become just another such case.